Given the tough competition you face while applying for a job as an artist, you need to come up with a stunning resume that sets you apart. Simply going for an ordinary, almost mechanical resume will not make the cut. You need something that holds true to the principles of your profession. 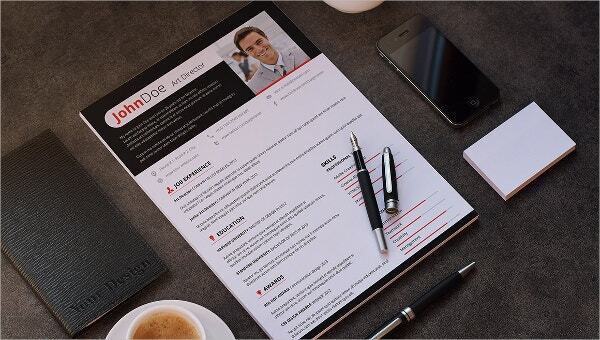 You would need a resume template that is creative, ingenious, imaginative and innovative. With that in mind, you would surely appreciate the resume templates for different artists here. 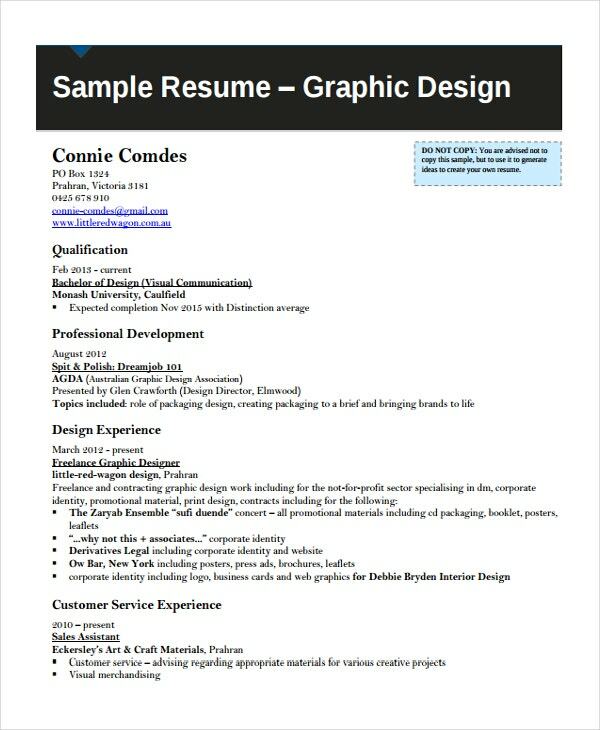 You may also see Combination Resume Template. The job of a makeup artist is extremely demanding and the job market is quite competitive. With the help of this easy to use resume template, you will be able to come up with a customized and ingenious resume. You may also see Web Developer Resume Template. Today, graphic designers are highly in demand. That means, you would have to set yourself apart with your resume. You can do that with this template which allows you to add your own information with ease. In case you are planning to apply for the position of a visual artist, you could take the help of this template. It allows you to add your prior work experience and all qualifications in an organized pattern. Creation of 3D art requires highly qualified artists. You would be able to showcase your talent and also your skills with the help of this amazing 3D artist resume template. 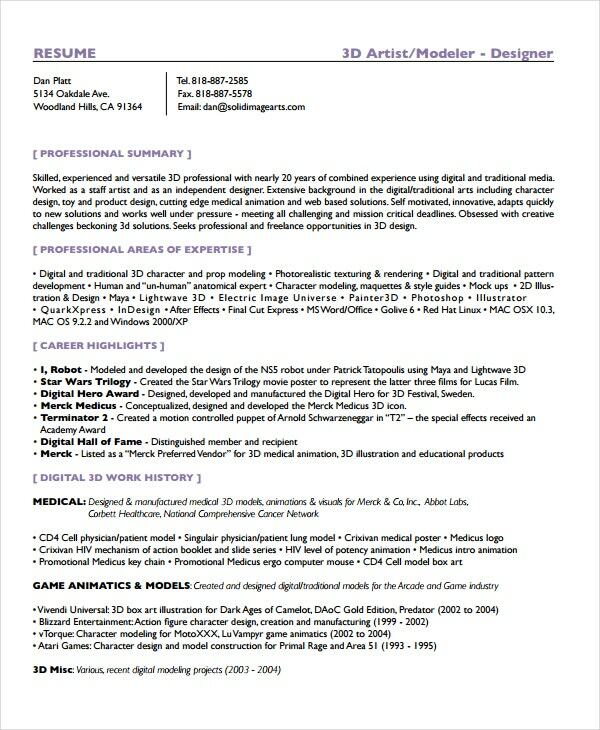 To apply for the position of a tattoo artist, you could use this resume template. It allows you to segregate your work experience and qualifications into neat sections which make it easier for the reader. 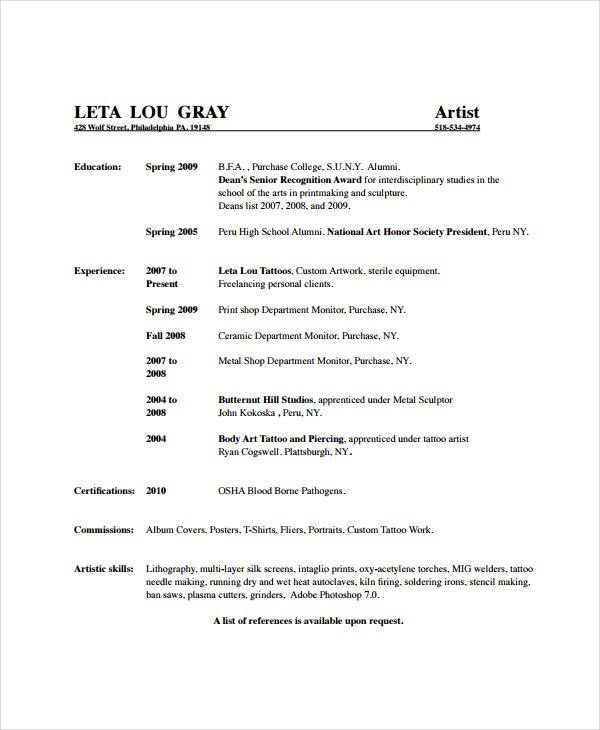 > Why Go for Artist Resume Templates? For an artist, it is imperative to truly express yourself through everything that you do. And that definitely includes your resume. Through your job application and cover letter, you should be able to offer a piece of your artistic sense to the reader. You may also see Customer Service Resume Template. That would not only give you an edge, but would also set you head and shoulders above the rest. If you choose to use these templates, you would be bypassing the dreaded hassle of creating a resume from scratch. Also remember, these templates have been designed exclusively to suit the needs of the job you have in mind. 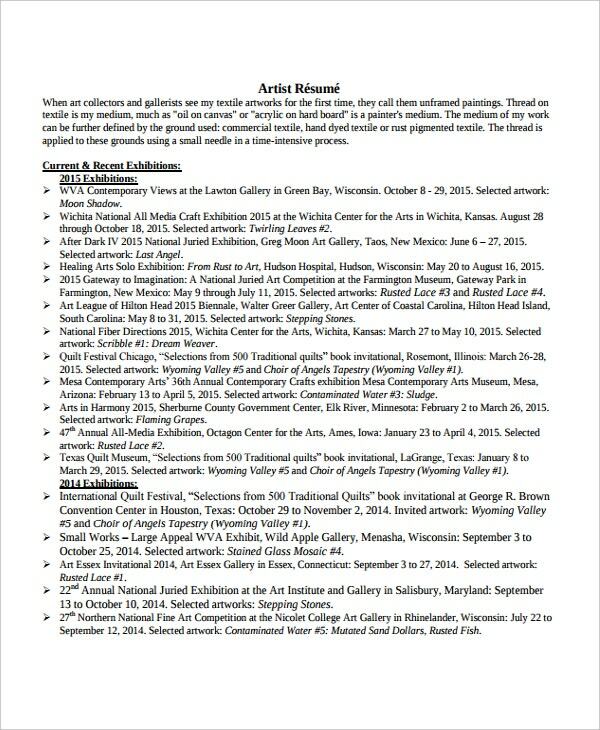 > What are the Benefits of Artist Resume Templates? Art doesn’t simply refer to fine arts. Anything that is creative and expresses the beauty hidden within is art, and these templates reflect exactly that. Each template has been designed to go with a different profession. 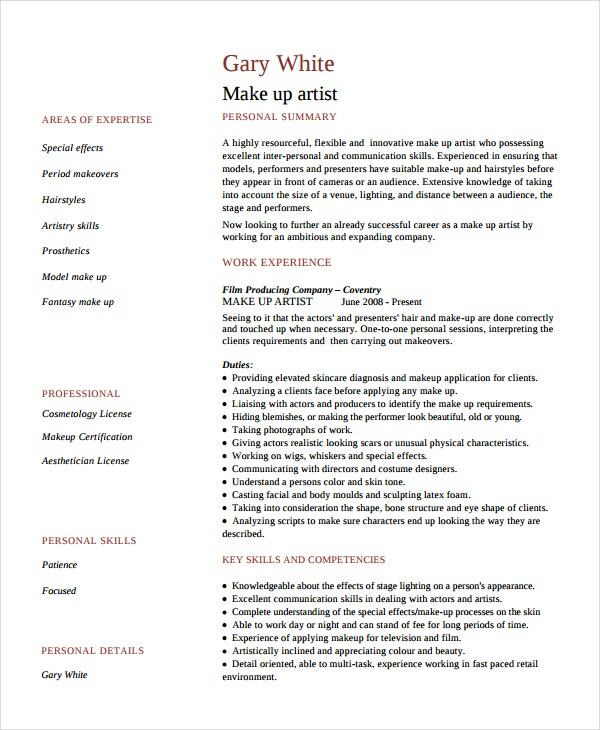 For example, you have resume templates for makeup artists, for visual and 3D artists, for tattoo artists and so on. 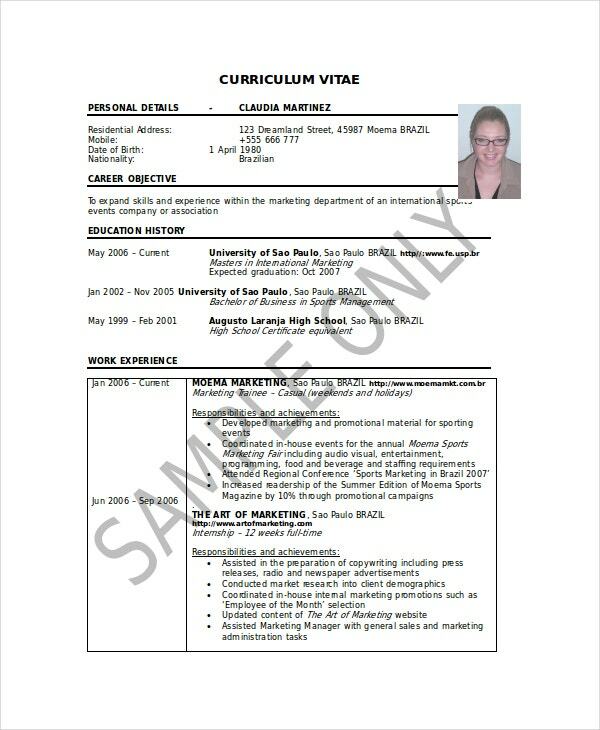 You may also see Data Analyst Resume Template. If you are considering a job in any one of the above professions, you would be able to make the most of these templates. Another major perk of using these templates is that you get well designed and professional CVs to call your own. > How to Use the Artist Resume Templates? Creating an artist’s CV is no easy task, yet these templates make it a whole lot simpler for you. While reviewing the templates, you’ll find that each template strictly adheres to the standard accepted pattern of a resume. However, that is the mere skeleton of it. 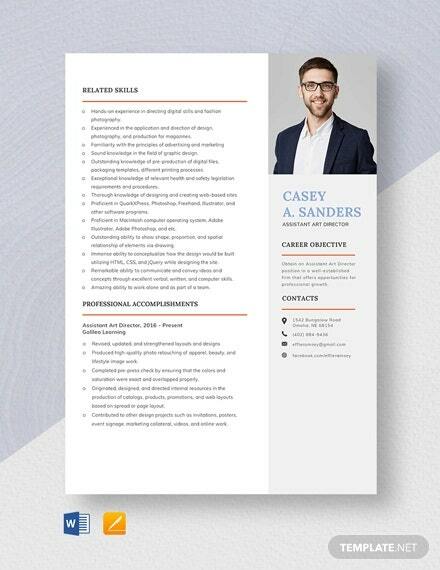 You may also see Lawyer Resume Template. You would have the option of filling in your own details since the major elements of the template are 100% editable and customizable. 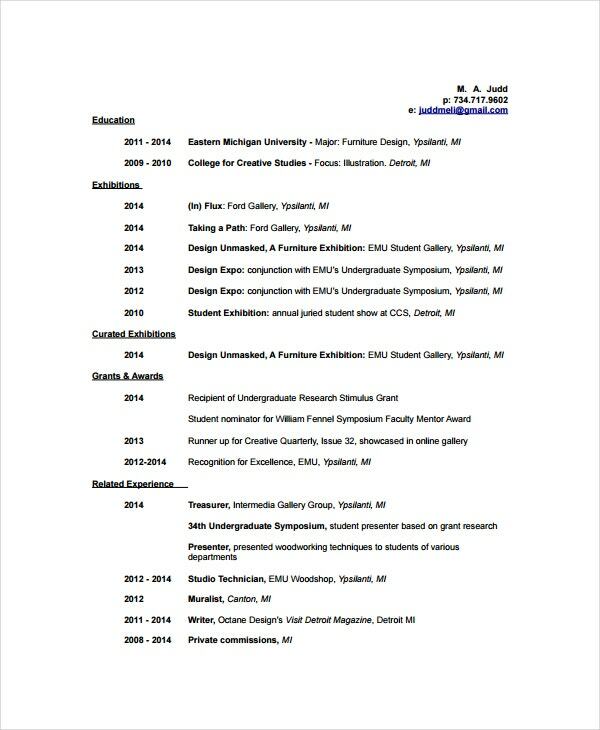 Also, all of the resume templates are in a PDF format; so you would be able to save them and edit them or even print them. The choice is entirely yours. Each of the resume templates have been customized to go with a separate job description. If you are looking for photographer resume, makeup artist resume, visual artist resume et cetera, you would find these templates extremely handy. With these, you would get the perfect resume that you always wanted.